Yeh Rishtey Hai High Voltage Drama. Everyone celebrates Ketki’s Sangeet. Mishti and Kuhu also perform in the Sangeet, since they are Ketki’s friends. Police comes there and shocks everyone. The inspector asks for Mishti and Kuhu. 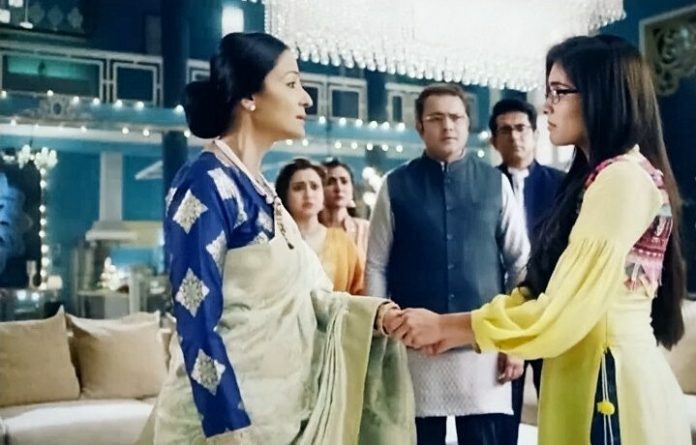 Meenakshi gets manipulating once again so that Mishti’s family refuses for the alliance themselves. Mishti doesn’t know why the police has come there to find them. Abir wants to help Mishti. Mishti tells the inspector that she is Mishti. Meenakshi asks them what’s happening. Meenakshi uses Mishti’s earrings to clear the misunderstands. She wants Rajshri to apologize to them and leave from the house. Inspector tells Maheshwari family that Mishti and Kuhu are accused for helping Ketki in eloping from her house. Meenakshi stops the arrest. She tells Vishwamber that she had filed the complaint in police, she didn’t know about Mishti and Kuhu, that they are responsible for this. She takes the complaint back and shows her big heart. Mishti and Kuhu find their family feeling ashamed, and feel embarrassed too. They don’t know what’s happening and why. Mishti tells Meenakshi that she has guided Ketki to return home. Meenakshi is mistaken about them. She is against the girls. She doesn’t want Kunal to marry Mishti or Kuhu. Abir raises a stand against Meenakshi. He gets blaming her and asks Kunal not to get in between. He tells Kunal that Meenakshi can do anything to control Kunal’s life. He doesn’t want Meenakshi to play with lives of innocent lives. He asks Meenakshi how did police know that Mishti and Kuhu’s house. Abir tells her that someone informed the police that the girls are here. Kunal wants to know the truth. He questions Meenakshi if she has called the police. Parul accepts that she has called the police and takes the blame on herself. She saves Meenakshi from her sons’ questions. Abir is sure that Parul is covering up Meenakshi’s mistakes.